Andre Drummond is 16 offensive rebounds away from passing Bill Laimbeer to become No. 1 in Pistons franchise history. 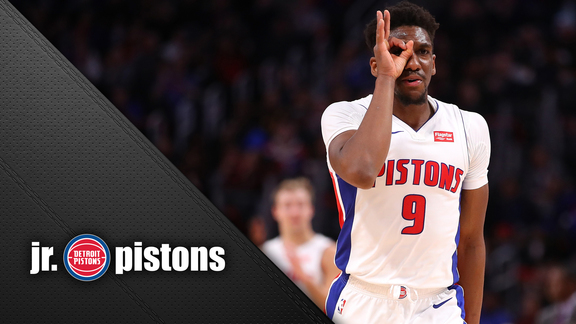 AUBURN HILLS – Sometime in the very near future, Andre Drummond will become the greatest offensive rebounder in Pistons history. If he has two more nights like he had Wednesday, when he collected 11 offensive rebounds, he’ll do it on Saturday in front of the home crowd against Sacramento. “I’m definitely getting that,” Drummond said Thursday upon learning that he sits 15 offensive rebounds behind Bill Laimbeer, No. 1 on the Pistons all-time list. Drummond passed Dennis Rodman for second in Saturday’s win over the Clippers, an achievement lost in the hype over Blake Griffin’s 44 points in his first game at Staples Center against his former team. By any measure, Drummond ranks with the elite offensive rebounders in history – Pistons, NBA or anywhere else. He’d have to play 13 more seasons at his current rate of 4.8 offensive rebounds a game to surpass the NBA’s all-time offensive rebound leader, Moses Malone, but the numbers say Malone might be his only real peer when it’s all said and done. Malone finished his career with 7,382 offensive rebounds over a 20-year ABA/NBA career. Take away his ABA numbers and Malone had 6,731 offensive boards over 18 NBA seasons. Second place – a very distance second – on the all-time list is Artis Gilmore at 4,816 over a 17-year career, the first five in the ABA. Drummond’s more than half way to catching Gilmore for No. 2. It’s tough to compare rebound numbers across eras, though individual rebounding numbers from the 1960s and ’70s – when shooting percentages were lower, stars played major minutes and offensive and defensive rebounds weren’t recorded separately – will never be touched. Rodman’s 1,530 rebounds in 1991-92 ranks 28th on the all-time list with the top 27 all coming in or before the 1970s, the majority of them in the ’60s. But Drummond has led the NBA in total rebounds for three straight seasons and in offensive rebounds in six straight – all but his rookie year. He’s on course to lead in both categories again, averaging 15.1 rebounds and 5.3 offensive rebounds. That despite the certainty that keeping Drummond off the offensive glass is in the top three bullet points of every opposition scouting report. Recently, he’s noticed, teams are sending multiple players to him every time a shot goes up. But that can come at a cost, too, creating opportunities for the Pistons in other areas. Some teams, aware of Drummond’s rebounding dominance, don’t risk going after any offensive rebounds for fear of giving up transition scoring chances. Dwane Casey can afford to send four other players back in transition and still be a potent offensive rebounding team because of Drummond’s elite skill. Laimbeer’s 2,429 offensive rebounds were spread over 13 Pistons seasons. Drummond will surpass him halfway through his seventh in a little more than half of the number of games. Laimbeer averaged 2.6 offensive rebounds a game. Rodman averaged 5.3 in his seven Pistons seasons. On a per-36 minutes basis, Drummond’s 5.6 is slightly better than Rodman’s 5.3. It’s a skill Drummond demonstrated upon hitting the NBA, even as a raw 19-year-old. He averaged 4.9 offensive rebounds per 36 minutes in 2012-13 as a rookie and hasn’t been below 5.2 since. Something his high school coach told him stuck. Soon, by the end of the week, perhaps, he’ll be the best offensive rebounder the Pistons have ever had – at age 25. He wants more.